Seahawks themed birthday parties are fun for kids of all ages, even the grown-up ones. If you’ve got a 12th man in your life, plan a Seattle Seahawks birthday party. You don’t have to live in Seattle to plan a Seahawks party, but you should live within 25 miles of Seattle if you want us to plan it for you. Keep reading for some great pictures of Seahawks themed party ideas, custom-made Seahawks party invitations and examples of Seahawks cakes we found. We found tons and tons of fun Seattle Seahawks Birthday Party planning ideas, like the printable party decorations above (just click to download). My favorite are the custom designed “Ticket to the game” party invitations from Etsy seller NatalieR. I wouldn’t recommend printing these out at home, I’d spend the extra money to have them printed professionally. Sometimes when you print things out at home, the printer makes little marks on it and it tends to look unprofessional. It might sound like a silly little thing to worry about but imagine how terrible that’s going to look hanging out in your scrapbook ten or twenty years later. Seahawks parties are incredibly easy to decorate for because it’s really just footballs, plus blue and green embellishments. Toss in a few Seahawks logos and you’re good to go. 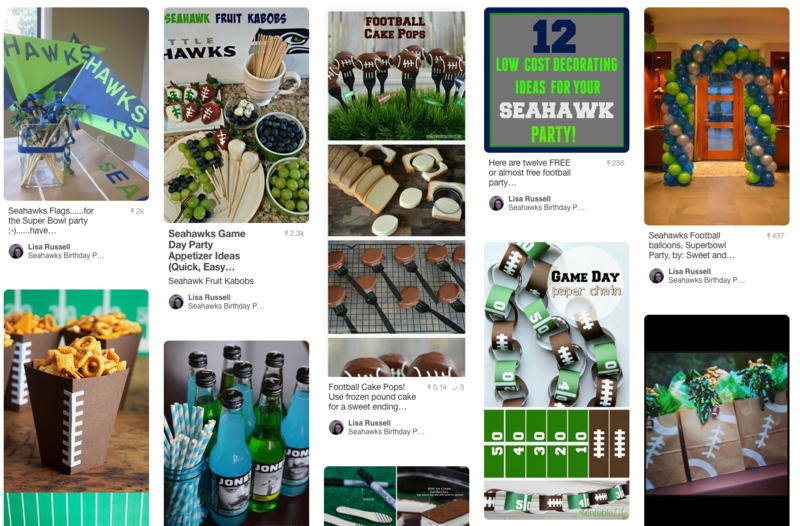 We found an entire Pinterest Board for blue and green party decorations and had a blast exploring the tons of amazing ideas for snacks, low-cost homemade decorations as well as fun things to buy for a Seahawks party. The little cake pops were so easy to make. Here’s a screenshot of what you’ll find on that board (it’s OK click it to get there, be sure to follow it for updates). When we decide which party games to play, we consider the age and abilities of the participants, the amount of space the family has available for game play as well as the weather. We have tons of outdoor football-themed birthday party games for kids and for adults. Games can be active and involve actual running and goalposts or seated in a circle for a calmer game-play experience. Our party planners are former childcare providers, scout leaders and teachers. We guarantee the activities and games we planned for your party will meet the needs of your group.